South Mimms (sometimes spelt Mymms) is Hertfordshire's most recent colonial annexation. When Middlesex was deemed to no longer exist, in 1965, it was acquired by Herts, which means that it's been part of its new county for half a century. Strangely enough, when I visited earlier this week I didn't see any bunting out to celebrate this fact. Equally strangely, even though it's practically on the hard shoulder of not only the M25 but also the A1(M) (road numbers with part of their nomenclature in parentheses are so much more classy than those common bracketless roads, don't you think?) it still feels like a village. The church, like so many in Herts (and elsewhere) was substantially restored in the 19th century (in this case by Street in the 1870s), but retains plenty of interest inside (some of it contributed by Street himself, who was much more than simply a ruthless restorer). 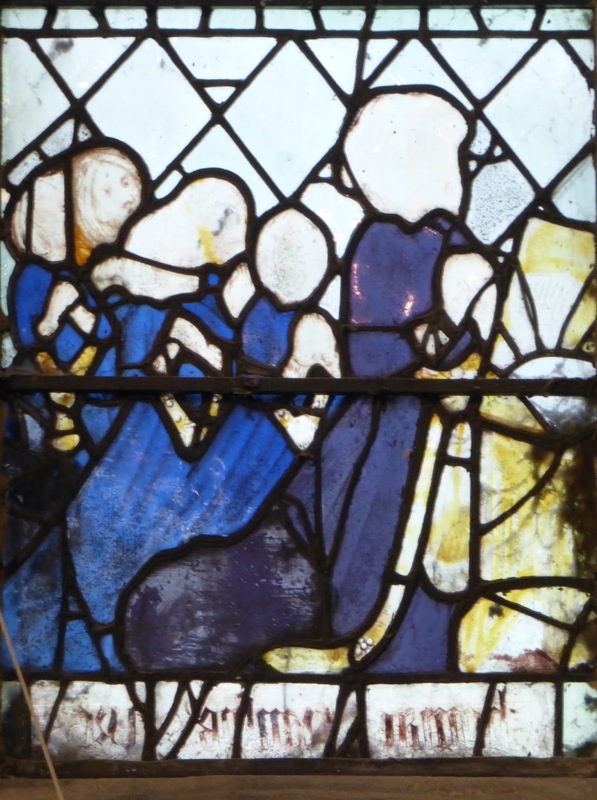 What caught my eye first on entering were the seven substantial fragments of stained glass in the windows of the north aisle and north chapel. (The photos below show them in order, from west to east.) 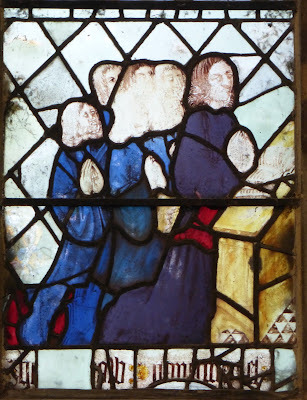 They depict members of the extended family of Henry Frowyk, a wealthy City merchant, at prayer. 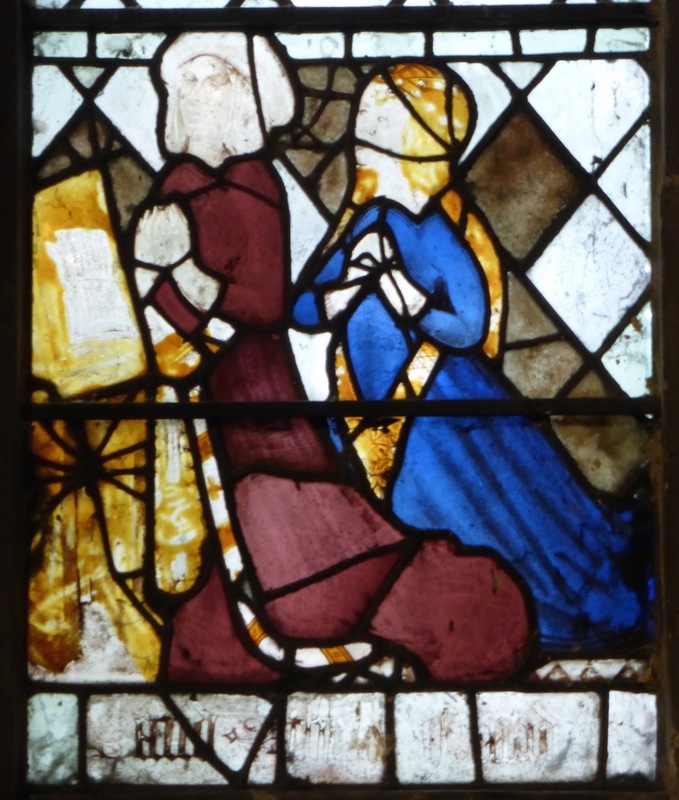 They are donor figures; when individuals or families paid for windows (or paintings) like these they wanted to advertise their piety, wealth and taste by having themselves included in the finished artworks. 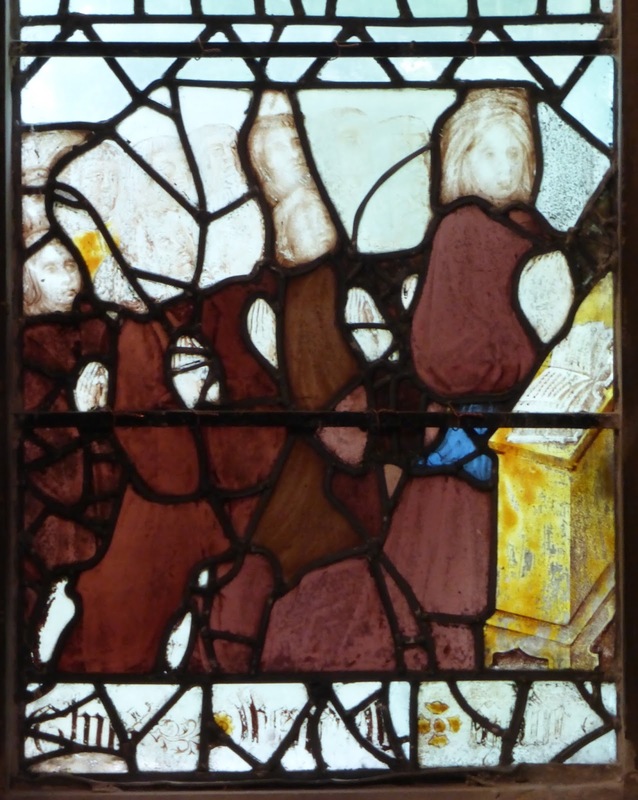 The surviving fragments are all at the bottom of the outer lights of three-light windows; originally the figures would have been seen to be praying to God and the saints depicted in the larger parts of the windows, now lost. The donor figures must have survived when iconoclasts turned up at the church one day to smash all images then seen as idolatrous. I wonder how the villagers of South Mimms/Mymms reacted? How did the surviving Frowyks react? 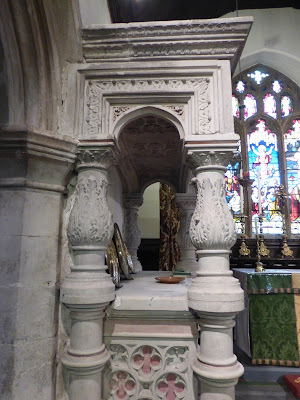 (This was probably in the mid 16th century, under Edward VI, or possibly a century later, under Cromwell.) 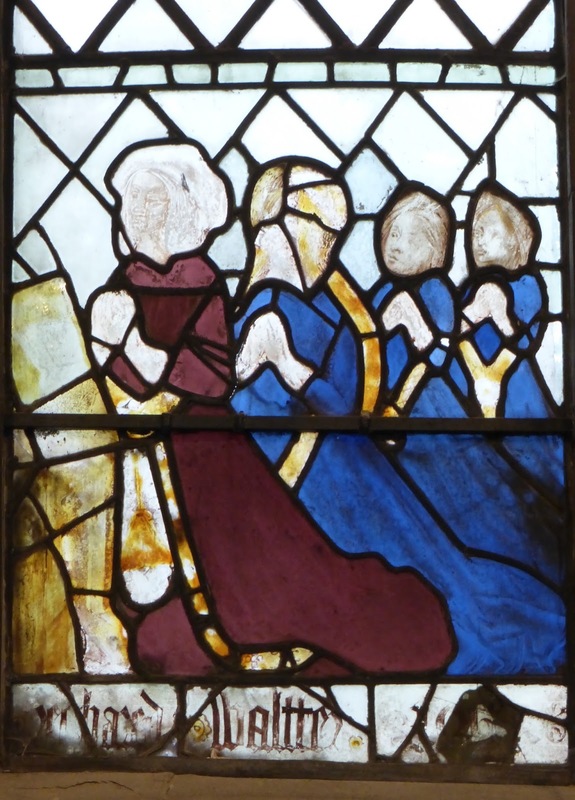 As the Frowyk family are there in the glass to be admired rather than worshipped, the iconoclasts let their images remain. So at least there's now something left for us to admire, though these fragments are a rather pathetic reminder of how much more has been lost. 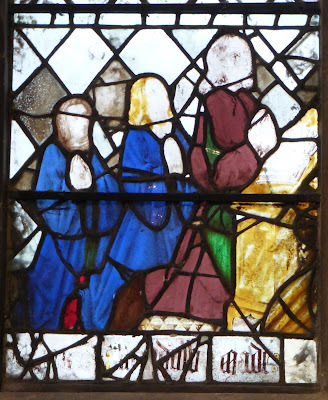 As you can see, the glass is in a poor state; in particular, the painted details (especially the faces and hands) have faded badly, so most of the heads look ghostly. But the colours are still bright, and I think you'll agree that there's plenty to enjoy in them. (I think the sixth window is my favourite.) The figures kneel at lecterns with open books; men are in the left lights, women in the right, except in the sixth window, which shows a couple. The windows reveal an age when religion permeated all aspects of life, but people didn't see why they shouldn't indulge in a little simultaneous shameless self-promotion. 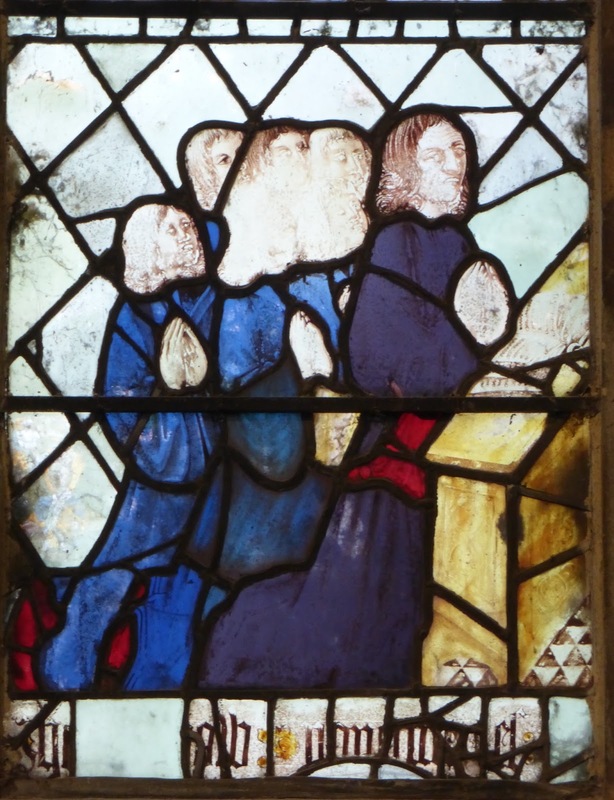 Pevsner says that two of the windows are dated 1526, and I'll take his word for it. I can see that the first and third windows have what look like lower case Roman numerals (Arabic numerals weren't widely used at this time), but I can't read them. 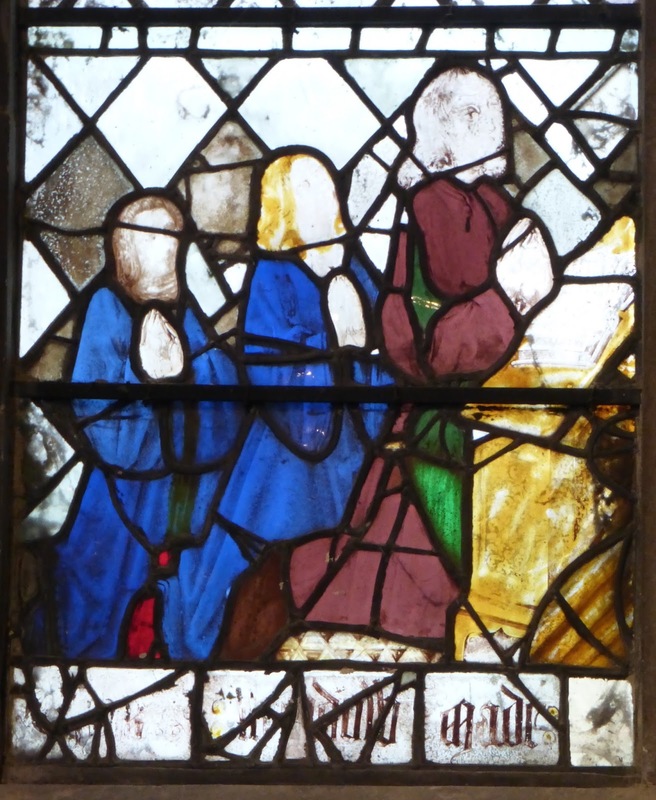 1526 was the year before Henry VIII first set about trying to get a divorce, so these windows were made just before the English Reformation. Indeed, they very likely survived only 25 years or so before they were so piously smashed. The Frowyks also paid for the north chancel chapel, and maybe the north aisle, to be built. 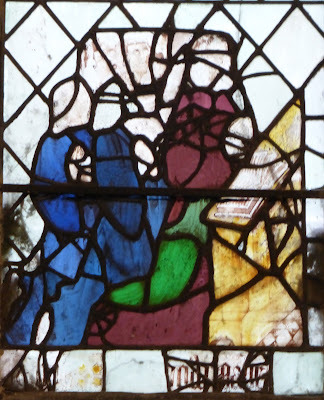 Henry Frowyk the Younger, who predeceased his father at about the same time the glass was made, is buried in the chapel. This is a pretty standard though well done late Gothic affair, in the style known as Perpendicular. 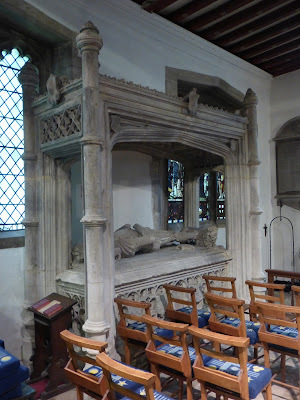 Henry's effigy rests his head on a very elaborate helm; is it topped by a bird? (It's hard to photograph adequately.) 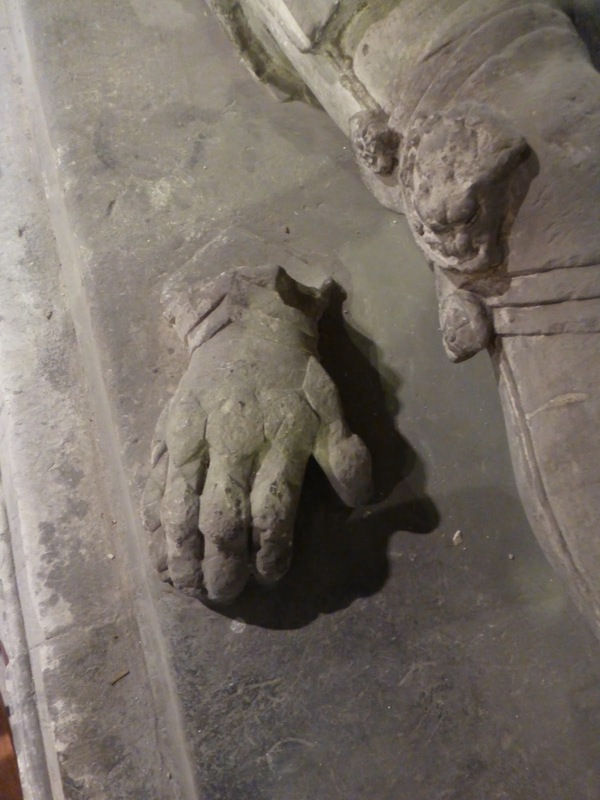 One of his gauntlets is on the 'ground' by his knees; it looks disconcertingly like the star of the old horror film The Beast with Five Fingers. 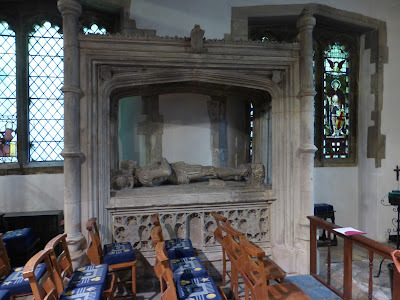 The monument of Henry the Elder in the chancel is much more interesting. This can't be more than a dozen or so years later than the previous monument (Pevsner says c.1540), yet the style, while retaining Perpendicular features, is very different. 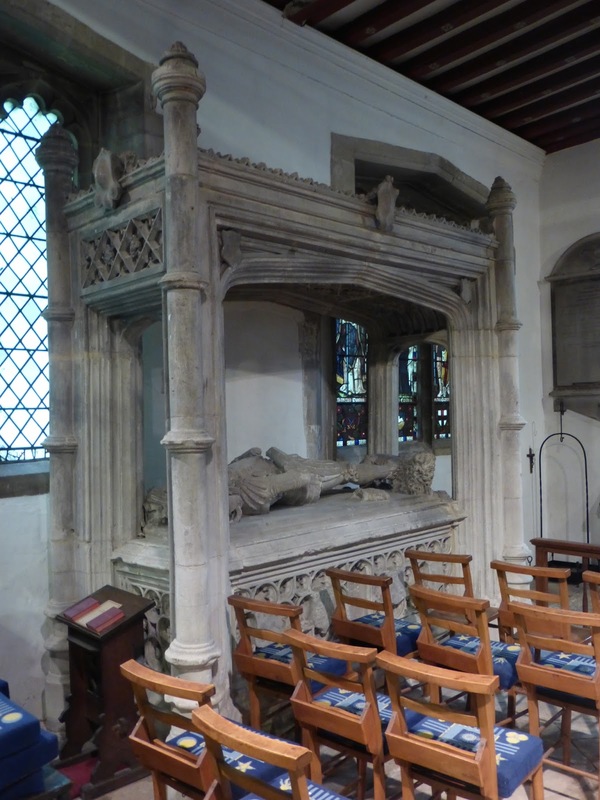 The basic layout is the same (minus the effigy), the arches are still pointed in Gothic style, and there are still quatrefoils on the tomb chest. But otherwise the detail is lavishly Renaissance. This is a remarkable transitional piece, showing (as Pevsner says) 'the gusto with which craftsmen at some distance from the Court threw themselves into the new Italian fashion.' 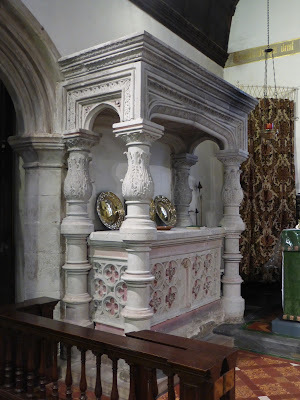 Paradoxically, the medieval elements also show innate conservatism, using a style (i.e. Perpendicular) that was almost two hundred years old. Was it designed and/or made by one or two hands? The Shell Guide to Hertfordshire calls it 'po-faced'. 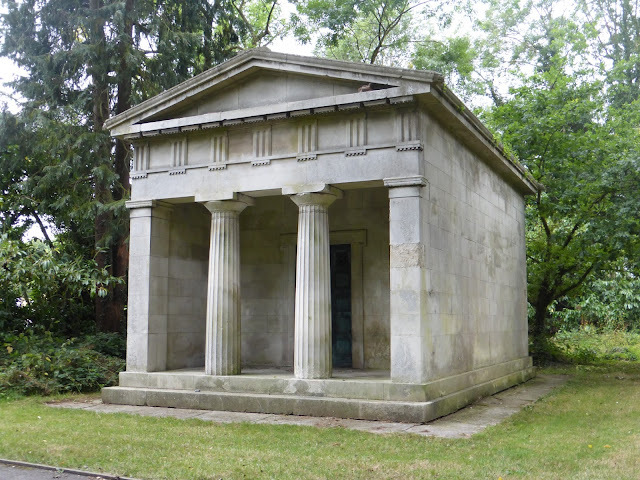 There are no visible inscriptions (but it was built c.1900 for the Cavendish-Bentinck family) which makes it seem all the more sinister and alien. It stands a few yards from the playground of a junior school; I hope the children's games of hopscotch (or whatever children play nowadays) aren't too overshadowed by this brooding building squatting just the other side of the fence. I timed my visit to South Mimms (or should that be Mymms?) perfectly: the church was locked as I arrived so I set off to find the key, but I'd gone no more than a few paces when two very nice ladies arrived to do the flower arrangements, and they very kindly let me in. 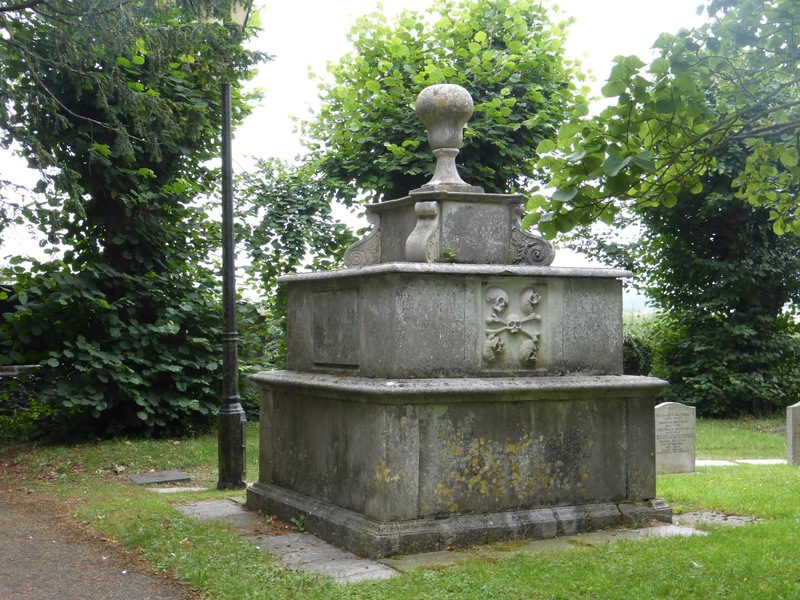 Then, when I'd finished looking around the churchyard and just as I was almost back at the car, it started to rain heavily, so I escaped a soaking. Then I was soon on the A1(M), being careful to once more savour those parentheses, and I was heading north to Icknield country. * I wrote this so confidently, and felt so clever when I wrote it, but looking at the lettering again I'm no longer convinced that it's reversed. The figures are facing the wrong way, though, and there must be a reason for this. They've probably been moved from a different window.